Some 360 million years ago, the fins of lobe-finned fish evolved into limbs and feet with digits. This descendent of the early tetrapods was able to leave the water, which may have proved advantageous to avoid aquatic competition and predation, and allowing pursuit of prey through the thick vegetation at the water’s edge. These tetrapods evolved into amphibians (“living a double life”), with many members inhabiting both aquatic and terrestrial habitats during the course of their lifecycle. There are 5000–6000 amphibian species divided into three groups, each with its specific characteristics: Salamanders and newts (Urodela = “tailed ones”) have long tails and two pairs of limbs. Caecilians (Apoda = “legless ones”) are legless, nearly blind, worm-like creatures found in tropical habitats. Some 90 percent of all living amphibians are classified in the third group, frogs and toads (Anura = “tailless ones”) that are aquatic as juveniles and land-based in damp habitats as adults. The female lays her eggs in water where they are externally fertilized by the male’s sperm. The tadpole, the larval stage of the frog, has gills to extract oxygen from water, a long tail, and a lateral line system, which is a sensory system permitting it to detect movements and pressure changes in water. After metamorphosis, the tadpole develops powerful muscular hind limbs, a large head and eyes, a pair of external eardrums, and a digestive system suited for a carnivorous diet; it loses its tail, lateral line system, and gills. The exchange of respiratory gases—oxygen and carbon dioxide—occur through the skin, a common characteristics in all amphibians. Many, but not all, amphibians undergo metamorphosis. A BELLWETHER FOR BIODIVERSITY. Since the 1980s, there has been an alarming worldwide decline in the number of amphibians and frogs, which has led to the extinction of some species. This represents a major threat to global biodiversity. Amphibians feed on algae and zooplankton, and are active predators of insects, which reduces the threat of many insect-borne diseases; they, in turn, are sources of food for other vertebrates. The causes of this decline have not been established but may involve habitat destruction or modification, pollution, and fungal infections. SEE ALSO: Fish (c. 530 Million BCE), Insects (c. 400 Million BCE), Plant Defenses against Herbivores (c. 400 Million BCE), Gas Exchange (1789), Thyroid Gland and Metamorphosis (1912), Food Webs (1927). 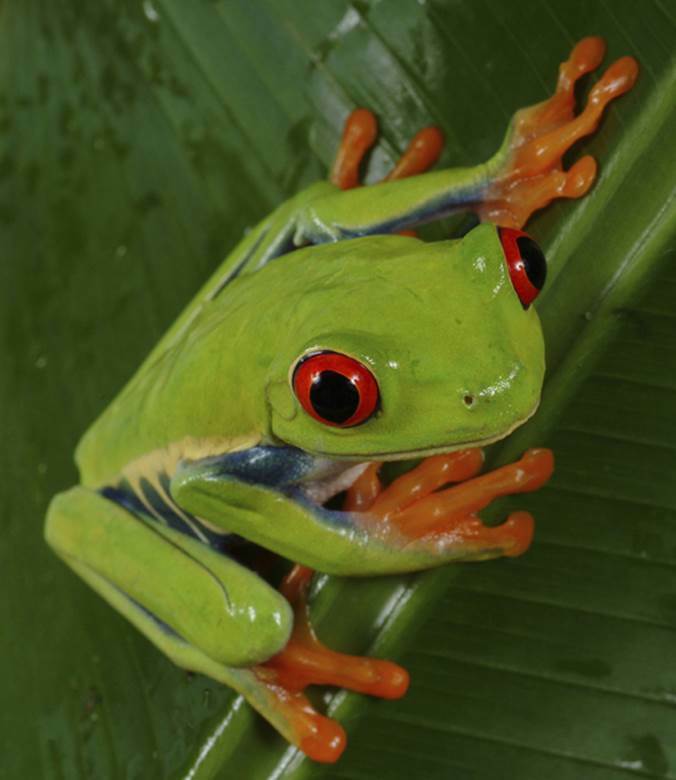 The red-eyed tree frog is an inhabitant of the Central American rainforest. When startled, the frog’s bulging red eyes flash open and its bright sides are displayed—a defensive mechanism called startle coloration—which surprises a predator bird or snake, allowing the frog to make its escape.